Description: For Teagan, these last few months have been heaven on earth- especially now that Garreth, her boyfriend and guardian angel, is earthbound. But perhaps Garreth is becoming a little more human than either of them expected. In this continuation of Angel Star, Lemniscate will draw you even deeper into the world of dark and light as Teagan realizes the angel who could possibly save them all is the one angel she feared the most. Thoughts: It actually kills me to not give this a higher rating. I loved the first one and I love the author and still want and crave more from her but this one just wasn’t what I expected. After Angel Star I had certain expectations or hopes of what the storyline would be for Lemniscate and Jennifer threw me for a loop. Don’t get me wrong. 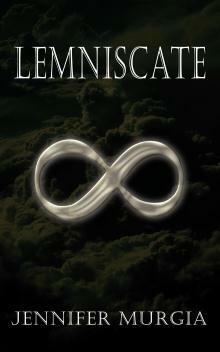 I still enjoyed Lemniscate. We get to see a different side of Garreth, Hadrian and even Claire (at one point). I just felt like when I finished it I had read a third book in a series instead of a second one. That is only because I was hoping Teagan would want to investigate something she had found out about her Dad, who had disappeared. Instead we really just get to learn more about Claire. We learn why she is the way she is to Teagan and others. Claire makes a decision that makes her step-dad, who is dating Teagan’s mom, go to Teagan for help. He has his own secret that at first makes Teagan a little weary of him. Even though we got to see different side to Hadrian it doesn’t make me change from being Team Garreth. Hadrian helps Teagan to have more understanding of the symbol on her hand too. If you haven’t read Angel Star then I would recommend that you do and then check out this one.